With more than capable noise-cancellation, Sony has created a unique take on the true wireless form factor that's proving increasingly popular. It might be a little bulky, but the noise-cancellation goes some way to mitigating this problem, and battery life is decent considering the functionality being offered. The tech industry seriously hates wires. Not content to simply eliminate their use connecting headphones to phone, manufacturers have now turned their attention to killing them off between the earbuds themselves. Apple wasn’t the first to embrace truly wireless buds, but its AirPods brought the form factor into the public consciousness in the way that only that particular tech giant can. 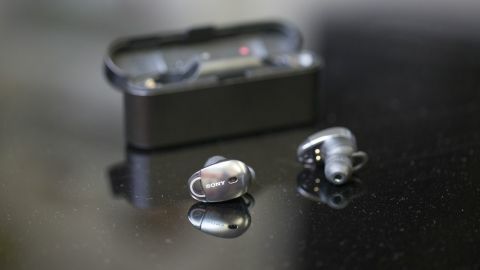 Now, a year on from the AirPod’s original reveal, the market for ‘true wireless’ earbuds is getting very crowded, and its this market that Sony has entered into with its WF-1000X. However, far from being simply another pair of earbuds in the crowd, the WF-1000X have a pretty unique trick up their sleeve with the addition of noise-cancellation. Noise-cancellation is a pretty difficult trick to achieve in earbuds generally, so its appearance in a pair of true wireless earbuds is remarkable. This comes down to personal taste, but we’re not massive fans of how the Sony WF-1000X earbuds look. In fact, were they not completely devoid of wires we'd have said that the WF-1000Xs look a lot like the kind of earbuds you’d get for free with a phone. Their slightly bulbous enclosures might be necessary to house the large antenna that Sony claims is required to achieve a solid wireless performance, but it comes at the expense of making these a sleek piece of consumer electronics like the AirPods or B&O Beoplay E8 earbuds. Their controls work well, but we could definitely do with a little more functionality. While the likes of the BeoPlay E8s have come up with innovative control schemes that manage to make the headphones small without compromising on functionality, the WF-1000X earbuds feel a lot more limited. On the left earbud you’ve got a single button which handles turning the headphones on and off and pairing them (NFC is also supported from the charging dock). Once you’ve got the earbuds paired, you probably won’t end up using this button much since the earbuds pair automatically when you take them out of their charging case. On the right earbud there’s a single button for playing, pausing, skipping tracks, and answering calls. It’s a nice selection of features, but we would have really liked to have seen volume control included. We’ve lost count of the amount of times we’ve needed to quickly adjust the volume of our music between different songs, and having to pull a phone out of your pocket feels so last decade. When we asked a representative from Sony about this, they said the company wanted to avoid having people struggle to push small buttons on an already small device, but with B&O adopting touch-sensitive technology, there are definitely options out there. The headphones hold three hours of charge, and come with a charging case that provides two additional charges. Sony also advertises that the headphones will be able to gain 75 minutes of playback time from just 15 minutes of charging. In our testing in the office and on a daily commute we never came close to over three hours of continuous use, but this limitation will make them inappropriate for longer journeys and flights. It shouldn’t be surprising that noise cancellation has been so successfully miniaturised (as with everything else in the world of technology), but even so we found it hard to believe just how good the noise-cancellation of the WF-1000Xs were. It’s especially strange considering the fact that most wireless noise-cancelling earbuds still make use of a neckband to contain their batteries. In our tests the WF-1000X did an admirable job at cancelling out most ambient noise. Like other noise-cancelling headphones, this effect is most pronounced on low frequency rumbling, making them perfect for public transportation. High-frequencies still leak through a little, but this wasn't any worse than what we’ve experienced from comparable noise-cancelling headphones. The compromise is, of course, battery life. At three hours these aren’t going to see you through a long plane ride, but it should be more than adequate to get you through a workout or commute. The sound signature of the Sony WF-1000X headphones verges on the chunky side, but that’s not to say they’re a pair of headphones that are overly lacking in detail. Play a busy track like The Fall of Math by 65daysofstatic and the detailing in the guitar work is preserved magnificently despite the multiple layers of piano and synthesised drum work. Bass has punch and heft to it, but it doesn’t overwhelm at any point. It adds weight without bulk. Meanwhile, spin up some Regina Spektor and the detail preserved in the vocals of a track like ‘Laughing With’ is excellent. There were moments when we honestly thought we were listening to a pair of wired earphones rather than the true wireless buds in our ears. With a pair of earbuds that need to not only maintain a solid connection with the phone but also with each other, good wireless connectivity is an absolute must, and it was only this that would occasionally remind us of what we were listening to. The WF-1000X come tantalisingly close to being perfect, but we did experience a couple of instances of the signal being lost on the right earbud. Now, no pair of wireless headphones in existence so far are completely flawless, and the streets of London, being filled as they are with competing wireless signals, are an inevitable challenge. But the signal loss was not a one off. It rarely lasted for even a full second, but it definitely occurred, and was an unfortunate blip in what was otherwise a very solid user experience. Of course, if you’d like to modify the sound then Sony’s Headphone Connect app is exactly what you need. It offers the usual combination of pre-set EQs, as well as giving you the option of completely customising the sound, and there are also a number of noise-cancellation presets to, for example, allow you to hear announcements while blocking out airplane noise. There are also a number of more novel features, such as being able to move the sound around a virtual space to make it appear as though the sound is coming from behind you, for example. We can’t see it being enormously helpful, but it was a fun feature to mess around with. With everyone rushing to bring out true wireless headphones, Sony has done well to find a unique feature in the form of noise-cancellation. What’s more surprising is that it achieves this so well, without compromising on sound quality, and while still providing a battery life that should be capable of handling most daily use. They’re not the most slimline of wireless earbuds. They protrude slightly from the ears, and the elongated housing that contains their aerials is bulky. Given the bulky housing is ostensibly to contain a bigger aerial it’s a shame that the connectivity isn’t 100% perfect, but it comes close enough that we weren’t too bothered by it. If you’ve been looking for a pair of true wireless earbuds, then the Sony WF-1000X do enough to impress. They pack in all the features of a pair of over-ear headphones, and they do it with zero wires at all. If this is what true wireless earbuds are capable of then we can’t wait to see where the form-factor goes next.